Ok so normally my posts go a little like this: 1) picture(s) of whatever recipe I’m going to share with you. 2) Then I say a few words about what I thought, what I’d change, etc. 3) Last of course is the recipe. Well today things are going to be a little different. Because today, you’ll get to hear a delightful tale about how I nearly burnt down a friend’s kitchen, see some photos of the process, be encouraged that failures can still be tasty, and learn an important value about trusting online resources. This is how they turned out after cooling. Definitely not anything like the picture. It still smelled like a delicious cookie though, so we weren’t going to let the looks of it stop us from eating it. After some skillful cutting, this is what we ended up with! Not bad huh? You’d never know we nearly burnt up the kitchen in the process. And bam! Check out that beauty! It looks perfect! 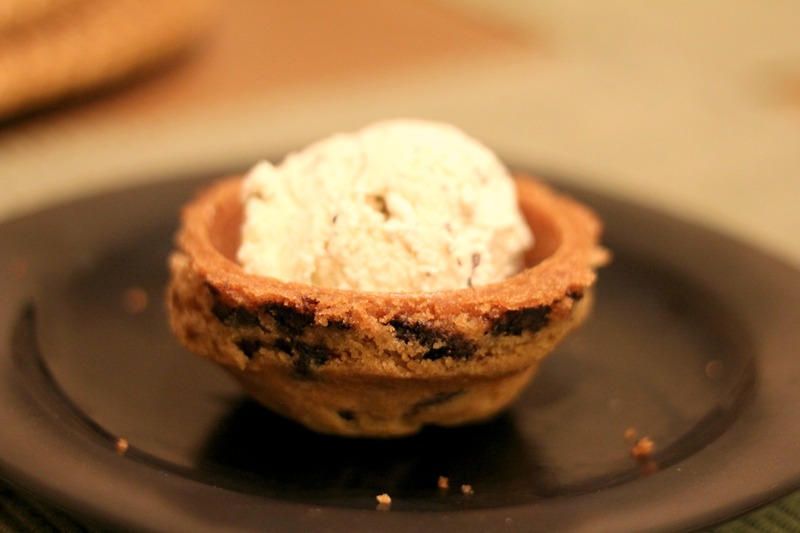 It was way more difficult than it was supposed to be, but we ended up with a perfect cookie cup for putting ice cream in! It was really delicious. 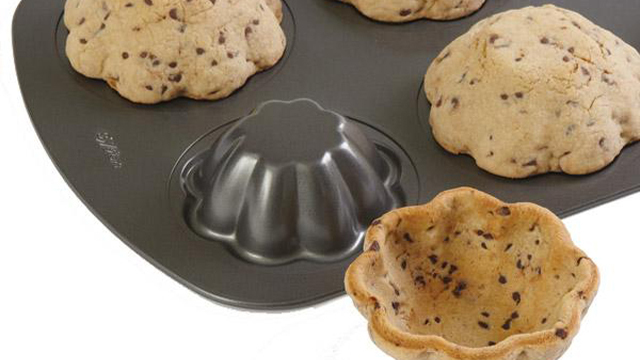 However, it’s surprisingly difficult to eat a cookie in the shape of a bowl. 1. Sugar cookie dough would be better than choc. chip because it would lay smoother. 2. Use way less dough. Maybe only cover the top of the cup and partially down the sides instead of all the way down. 3. Don’t give up. Not even when your house is full of smoke. Yeah, I’ve seen these on Pinterest and wondered how they would turn out – looks like you mastered it! Love this blog! Thanks for all of the great tips. Any tips on how to cut it? Carefully! haha there’s really not any rhyme or reason to it. Just make sure it’s cooled completely, and it would probably help to have an extra set of hands to hold the pan steady while you cut. This is so cute Lindsay! I did the same exact thing. Too much dough, cookie dough ran everywhere. 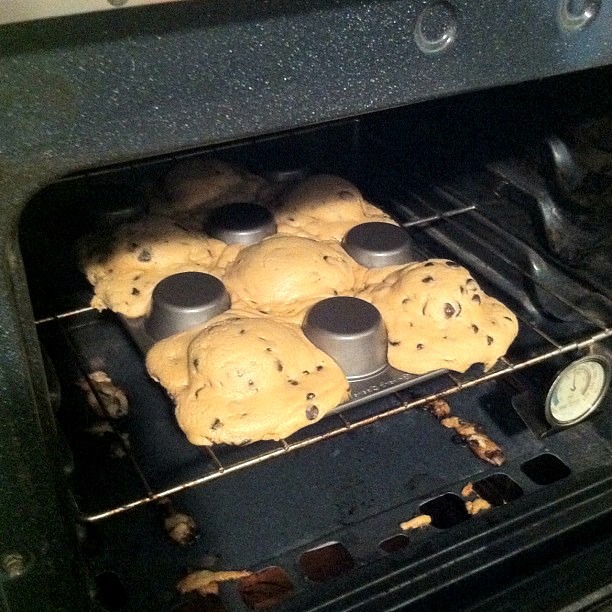 Oh well, they’re still cookies! There really isn’t a recipe for this post. 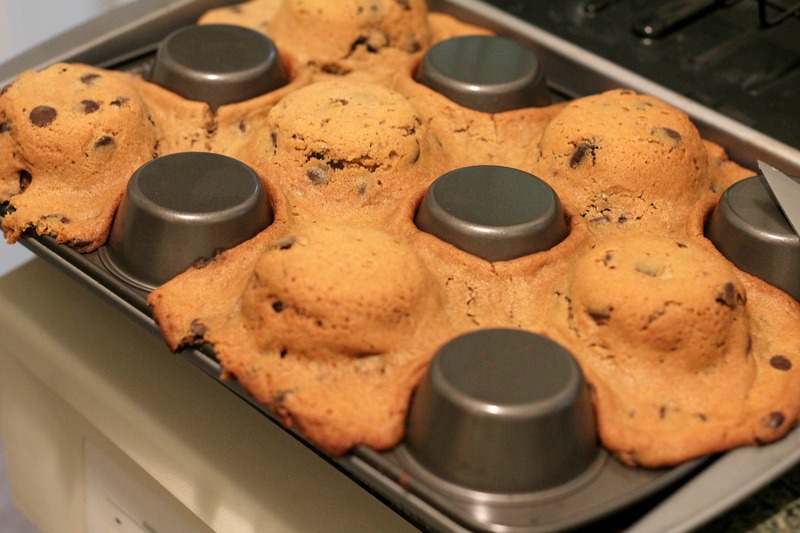 I just bought some Pillsbury cookie dough from the store and spread it over the back of the muffin tin. 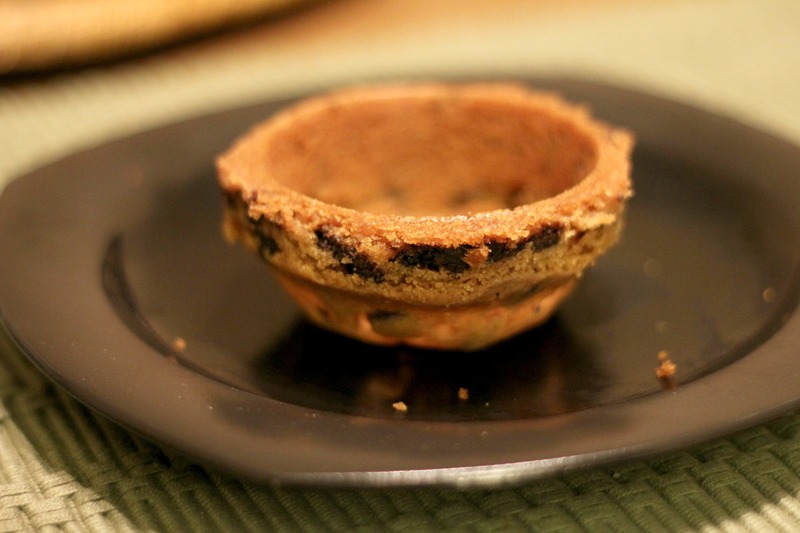 If you have a homemade cookie recipe you like, then you could use that if you prefer.